PCON Editor Dr. DePaolis shares his perspectives on each issue's editorial coverage. Dr. Fingeret analyzes the direction of glaucoma management. Tax law interpreted and applied to the optometric practice. Editor Leo P. Semes, OD, solicits authors with actual cases challenging readers to make the diagnosis based on clinical findings. Dr. Gonzalez shares ways to communicate with patients and effectively market your practice. Dr. Brownlow offers advice on navigating the complexities of proper coding and Medicare regulations. 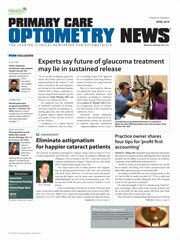 Members of the Optometric Glaucoma Society discuss recent research and its relevance to clinical practice. Mr. Rudzinski provides tips on investments and retirement planning. In his blog, Doug Rett, OD, FAAO, digs deeper into questions every eye doctor has had at one point in his or her career. He sees patients and works with students and residents at the optometry clinic for the VA Boston Healthcare System and will use his blog to bring the teaching points he sees in clinic to a larger audience. Contact him at doctorrett@gmail.com. Disclosure: Rett has no relevant financial disclosures. BLOG: Why does hydroxychloroquine retinopathy look like a bull’s eye? Josh Johnston, OD, FAAO, evaluates the nuances integral to success with new technology for premium cataract surgery. He is the clinical and residency director at Georgia Eye Partners in Atlanta. Johnston reports he is a consultant to Alcon, Allergan, Bio-Tissue, Johnson & Johnson Vision and Shire. BLOG: What goes into a premium cataract surgery experience? John A. Hovanesian, MD, FACS, focuses his blog on real-world comanagement cases with valuable take-home messages. Dr. Hovanesian is a specialist in cornea, external ocular disease and refractive and cataract surgery with Harvard Eye Associates in Laguna Hills, Calif., a clinical instructor at UCLA Jules Stein Eye Institute and a member of the Primary Care Optometry News Editorial Board. Pacific Cataract and Laser Institute optometrists Brooks Alldredge, OD, and Kerri Norris, OD, FAAO, discuss comanagement of cataract, refractive, glaucoma and corneal surgical cases, including surgical concepts and postoperative complications. The authors report no financial disclosures. BLOG: To toric or not to toric? In his videos, Agustin L. Gonzalez, OD, FAAO, advises optometrists on communicating with patients and effectively marketing the private practice through the use of social media. Gonzalez is in private practice in Dallas, serves as adjunct faculty at InterAmerican University and is a member of the Primary Care Optometry News Editorial Board. BLOG: Why do I need an eye exam? Ron Rosa, OD, has practiced optometry in North County and Encinitas, Calif., for more than 25 years and was named the Patients’ Choice Award winner for Encinitas optometrists. His blog offers advice on relating to patients, keeping them happy and being a likable doctor.